Recently my friends and I decided to break the cycle of reading and writing essays for the first time since coming here by taking a trip to the beautiful seaside town of Brighton. I haven’t spent much time outside of Oxford yet this term because we’ve had so much school work, but I figured it was high time to explore a new place. Brighton is a few hours away from Oxford, so getting there was a bit of a process. We ended up taking a bus from Oxford to London and then another one from London to Brighton (much cheaper than a direct bus, but also MUCH longer). 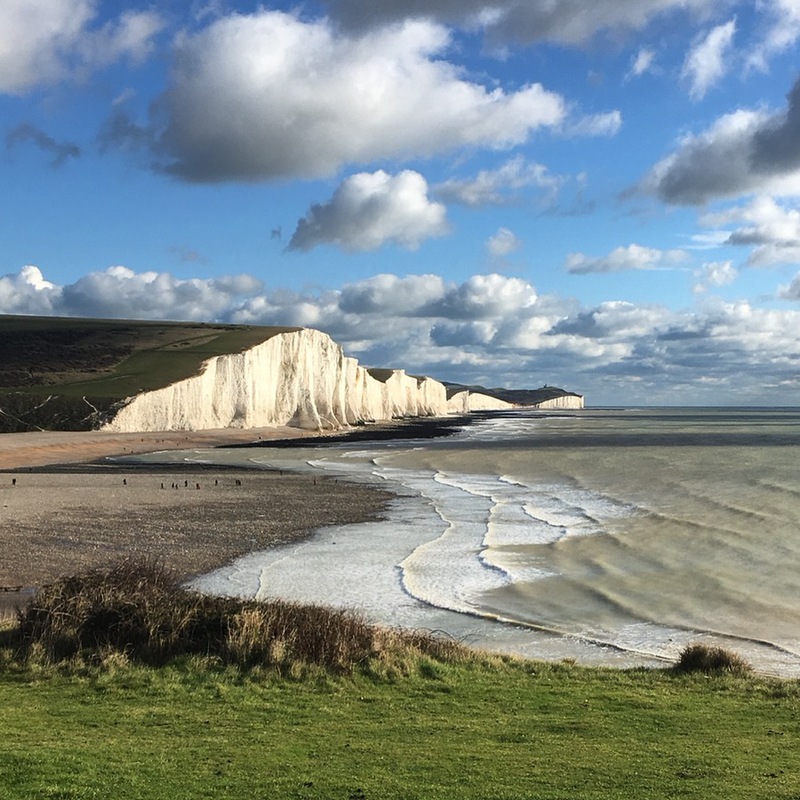 Our last stop on the trip was to the Seven Sisters, which are those white cliffs in the photo above. There are two different trails leading up to this viewing point, both of which take under an hour to walk. Pictures can’t do this breathtaking, magnificent view justice. I felt so lucky to be looking out at this amazing sight on such a beautiful day with my friends. It’s truly one of the most incredible places I have ever been. I thoroughly enjoyed my short trip to Brighton and would go back for another visit in a heartbeat. If you’ve never journeyed to this adorable seaside town before, definitely add it to your bucket list! Have you ever been to Brighton, England? What’s your favorite seaside town? Let me know in the comments section below! I think the closest cities to Brighton that I’ve been to is a mesh between Santa Cruz and Half Moon Bay in California. Santa Cruz is famous for its boardwalk and Half Moon Bay has magnificent viewing points. It’s great that you’re travelling and making the most of your year in England. I’m really enjoying your Study Abroad series 🙂. Even at 22 my daughter still forgets that she’s an adult and begs me to take her to Brighton. We had so many good times there when she was a child. I think it’s her fiancee’s job now. It was always so cold. I’ve never been to brighton, but from all the English classics I’ve read it’s like the typical seaside town and although it looks freezing, I’m glad you had fun! I studied abroad in Brighton and loved it so much, I moved back when I graduated! Brighton looks so nice. I’m glad you’re visiting other places and sort of taking us along with you. It looks like you’re having such a great time. Oh damn, that beach and those white cliffs are GORGEOUS. I’ve never been to England at all but I’m dying to go!